A boot sequence is a sequence of key strokes to be executed in order to initialize the device so that it is ready for testing. You can configure the boot sequence for every device separately. Currently you can only set up the Boot sequence for HbbTV / Freeview Play platform. To set up the boot sequence connect to a device and open the device configurations page, look for the field marked Boot sequence. Once you understand what boot sequence you may need for your device, you can edit the sequence, then move on to testing it. Once you create a boot sequence for your device, it is a good idea to use the test button next to your boot sequence in the devices configuration. Creating a boot sequence may require some trial and error therefore testing the boot sequence quickly using the button will be greatly beneficial. Once you press the test button, you will see the device going through the boot sequence you designed. However, there is a catch. This sequence will only work if your TV is already in the TV mode. If the TV input is switched to high-definition media interface (HDMI) or if an application already runs on the device, the sequence will do something completely different from what you expect. Channel Up switches the channel thus forcing the device into the TV mode. OK OK confirms the channel switch. 2 0 1 OK puts in the number of the channel to switch to and confirms the choice. Note: Suitest presses Exit followed by Red after your boot sequence is executed. 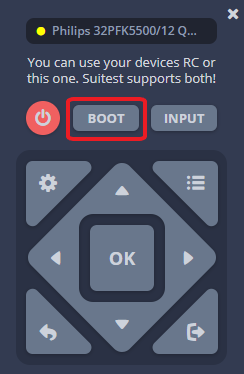 If the device has been turned off, Suitest will turn it on and wait for it to boot up before executing the boot sequence. You can use the Boot sequence for other platforms in the same way as for HbbTV platform, but for a different purpose. For example, you can set up the boot sequence to launch a specific application or set a necessary setting on the device. Please note that on a device supporting multiple platforms, you can currently configure only a single sequence. When you are connected to the device in Suitest you can use the virtual remote control (VRC) as a replacement for the traditional remote control. VRC also features the BOOT button. This button will execute the boot sequence that is specified.